May 11, 2017 was the last time that Wishes was seen at the Magic Kingdom park at Walt Disney World. 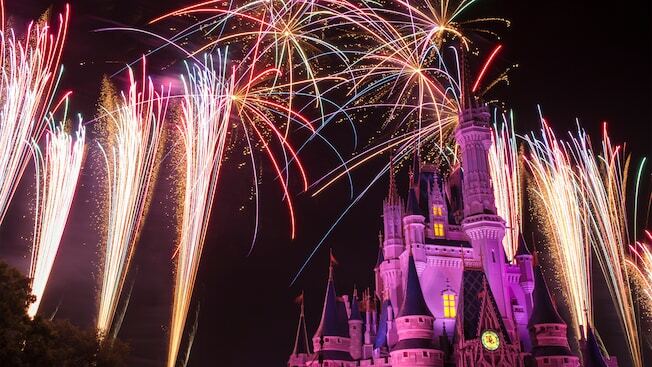 Removed so that the Happily Ever After Fireworks show could be presented, the closing of Wishes was hard for many Disney fans to take. In the last week or so, I’ve been hit with the nostalgia bug while walking our dog River, and we’ve been listening to our music for Wishes in the morning. That reminiscing is what led to the idea of writing about the things that we are missing at Walt Disney World. We’re calling this series “Missing the Magic”. For the longest time, I was not a fan of fireworks of any sort. Wishes, Illuminations, your local 4th of July fireworks, the fireworks at the State Fair in Raleigh, NC, I wasn’t having it for any of them. But then, one day my wife Cindy suggested that Sophie and I get earplugs for when the fireworks were going on, and a love for the fireworks was born. I have a lot of great memories of Wishes from over the years. Sadly, though, my fireworks picture taking skills are limited, so I have very few good pictures. One of my favorite experiences, though was the day that we saw and heard Wishes while having dinner at Cinderella’s Royal Table! Are you missing Wishes today? If you are, have a look at the Magic Kingdom 40th Anniversary Wishes, courtesy of YouTube and the fine folks over at WDWMagic! 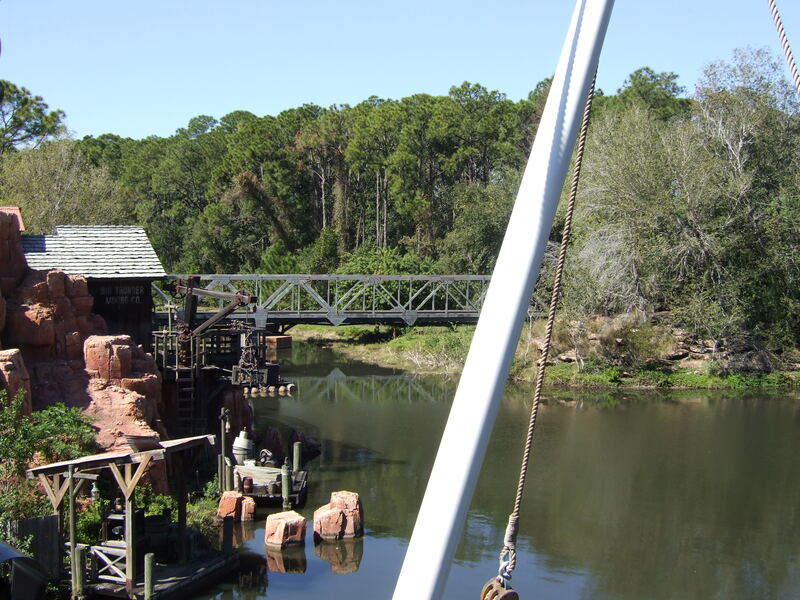 What are you missing from Walt Disney World? Let me know in the comments below, or reach out to me our social media sites to let me know. Lastly, if all you are missing is being at Walt Disney World, shoot me an email and let’s talk about how we can make that wish come true for you and your family! Email me at mike@pixievacations.com, and thanks for stopping by today! “The ‘must-have’ Guide for your drive to and from Florida!” This is how Along Interstate 75 is billed on the cover and I can say from personal experience that it’s that and so much more. Publisher: Mile Oak Publishing Inc. When my wife and I were planning our first drive down to Florida in 2007 we felt a little apprehensive. We hadn’t driven that far into the States before and had no idea how to plan hotel stays and how to find out what to see along the way. Of course, every State has a Welcome Center as you cross the border, but we wanted to do some advanced planning. We were used to using Birnbaum guides for planning our itinerary at Walt Disney World, and so we checked the travel section at our local book store for similar travel guides. We found Dave Hunter’s Along I-75 and have never looked back! With 19 years of publication behind it this guide is quite probably the most comprehensive tourist guide of its kind. Part map, part guide-book, it really does have everything the traveler needs to enjoy the drive between Detroit and Florida and back again. This publication also doubles as a history book. If the drive is starting to bore you simply have your navigator (spouse/travel companion) read from the many white pages and enjoy hours of interesting stories about the people and events that happened all around you along the I-75. But the main use of this publication is as a map. As mentioned, there are separate pages for going to Florida from Detroit, appropriately with yellow borders (for the sun you know!) And another set of pages for traveling back. Speed limits, speed traps, exits, alternate routes, gas and food, entertainment, and trivia are all found on each and every page. The key feature is the ‘upside down’ orientation. If you place the publication on your lap, you can follow the route from the bottom of each page to the top, mimicking the forward direction of your driving. Each page covers approximately 25 miles or 30 minutes of driving time. So if you want to eat in 2 hours, simply turn four pages ahead and check to see what restaurants are available in that area. Want to stop for the night in 4 more hours time? Turn 8 pages ahead and pick your favorite hotel. Every vacation must come to an end and you eventually have to drive back to Detroit from Florida, so you simply follow the blue pages home again. Blue for cold. Snow. And depression! Review: I can’t imagine a more comprehensive but easy to use guide! It is one of the few publications out there that deserves a full 5 out of 5 Stars. I’d give it more if I could! We hope to put this 19th Edition to good use early next year as we once again take to the American highways (the I-75 specifically) to visit our happy place in Florida. In case you’re wondering, our happy place in Florida is Walt Disney World. Duh! Now I know you are probably going back to Disney to pick up even more treasures to add to your collection. And yes, some more memories too. But don’t rule out one of the best ways to generate capital to make that trip possible – selling off some of your existing Disney swag! Welcome to this month’s Blogorail Red Loop. Today we are sharing ways to save money for your Disney vacation. Do you like to dust? I don’t so my wife is always after me to dust my collectibles! I try to tell her that if I don’t dust, then when I pick up a collectible, I will know exactly where to place it down again due to the dust ring. And that is why men are more creative thinkers than women! But you may want to clean the item up a bit before you sell it. Or have your spouse do it. Outer Space is infinite. Your shelf space is not. Sooner or later, or probably sooner than later, you will start to run out of places to put your Disney stuff. When your children’s toys are all over the floor because their toy chest is full of your collectibles and your spouse’s closet space is disappearing, it may be time for a purge! Back in the 1980’s you were all about The Little Mermaid and Roger Rabbit, but now we are living in the Millennium. We now have Baymax and Hank the Septopus merchandise everywhere! No one wants to look at the same stuff year after year, right? OK, maybe we do, but sacrifices must be made. We’re trying to get to Disney, people! You have it. Everyone else wants it. That is basically how the demand for Disney collectibles goes. So why not take advantage of someone else’s obsession and unload some unwanted stuff? They’ll thank you for providing a new-to-them treasure and you’ll add some much needed capital to your Disney trip jar! You want it. Your unwanted Disney collectibles could turn into it. 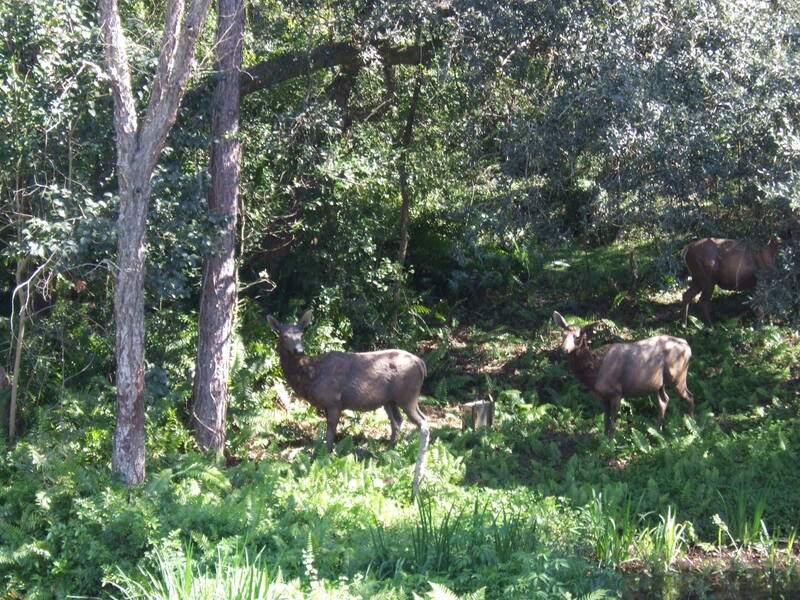 And seriously, if you want to go on a Disney vacation… you’re going to need lots of it! So get out there (or online) and sell! Sell! Sell! And if you do, I’ll see you in the parks! Welcome to this month’s Blogorail Green Loop. Today we are taking a tour of the Lands at Walt Disney World’s Magic Kingdom Park. You have arrived at Walt Disney World! Now, where do you start? Most will recommend that you begin your visit at The Magic Kingdom. If you’ve followed this loop in order, you will know that there are many Lands in this particular park. I hope to show you why the smallest of them is still worth your time! This Land was adapted from a Disneyland concept called Liberty Street, which would have extended from Main Street USA. Themed after colonial America, replicas of both the Liberty Bell and the Liberty Tree can be seen here. Two very popular attractions are also found here, namely The Haunted Mansion and The Hall of Presidents. 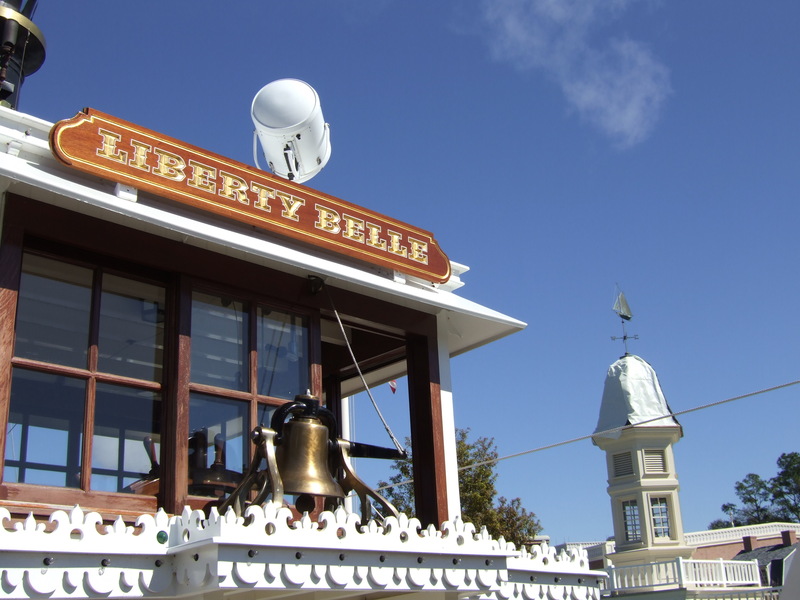 You can also find the beautiful Liberty Belle steamboat. 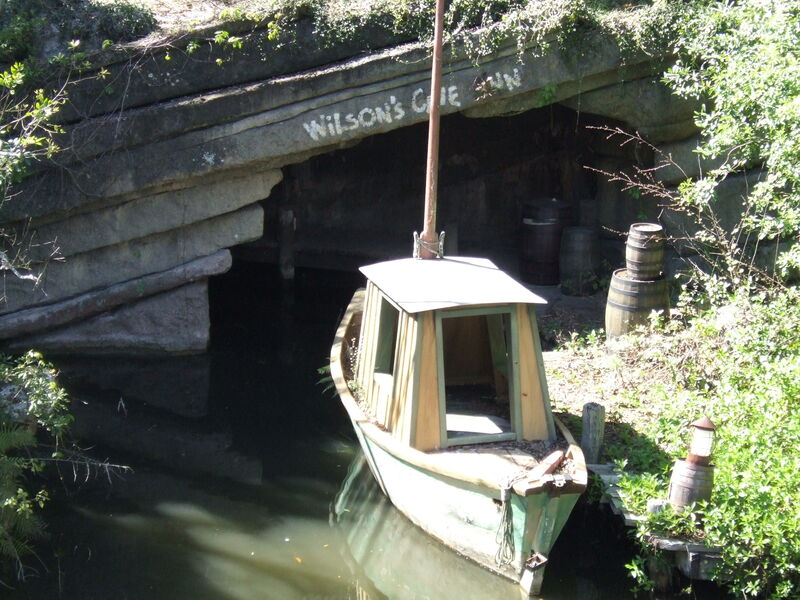 You can even find references to old live-action movies, like Wilson’s Cave Inn from the Davy Crockett adventures where he met Mike Fink. 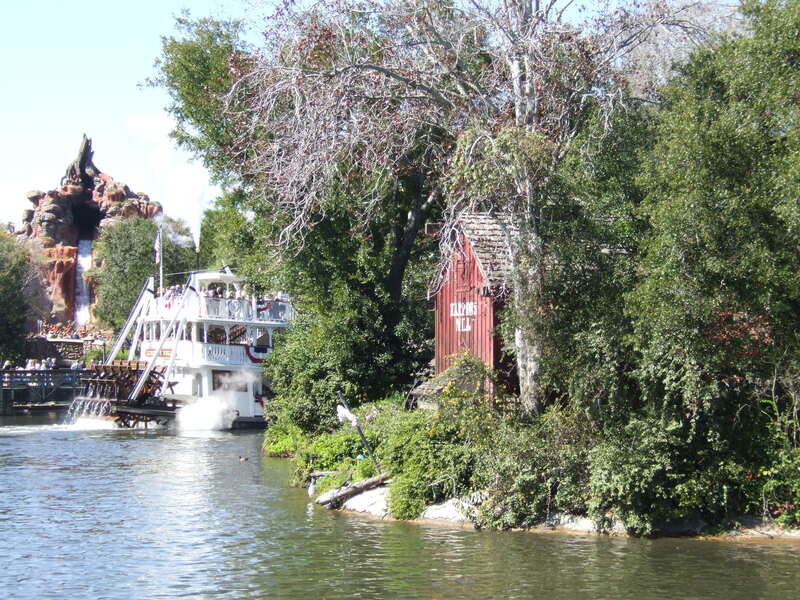 Mike Fink’s Keel Boats ran on the same waters as the Liberty Belle from 1971 to 1997. And some good-natured fun can be had in the stockades! Although, I doubt prisoners found them much fun back in the day! Find the replica of the House of Burgesses and look upstairs in the window to find Paul Revere’s lanterns signifying “Two if by sea”. The Liberty Tree is an actual 100-year-old oak found on the property and transplanted, with a younger oak grafted into the base. The Liberty Bell replica was cast from the mold of the actual Liberty Bell in Philadelphia. It is the only bell ever cast from these molds. The Liberty Bell was placed in Liberty Square in 1987 to commemorate the U.S. Constitution’s bicentennial. There are architectural representations of each of the original Thirteen Colonies. The state flags of each of the original 13 states, as well as the American flag, fly in a plaza in the center of Liberty Square. There are three restaurants to choose from: Columbia Harbour House, Sleepy Hollow, and the Liberty Tree Tavern. Shopping opportunities are slim! So if you like history and want a smattering of it during your next vacation, be sure to take in the atmosphere and edutainment of Liberty Square! 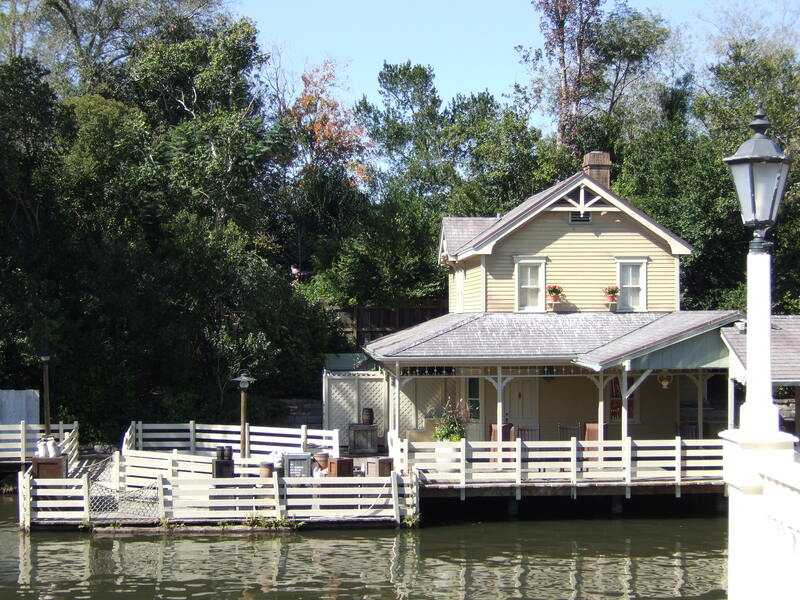 For more tours of the lands of the Magic Kingdom, check out the other great posts from the Blogorail! 1st Stop – What’s the Point? | Main Street, U.S.A.